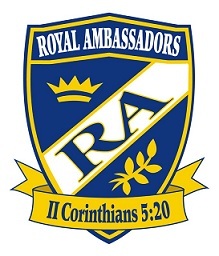 Royal Ambassadors (RA’s) is a mission organization for boys grades 1 thru 6 that missions as a lifestyle. We use weekly meetings, lessons, games, camping trips, sports, special events and projects to accomplish this. Each boy earns badges and awards for their efforts, along with a sense of accomplishment and self-esteem. Royal Ambassadors help build tomorrow’s Baptist men from today’s Baptist boys. The RA’s meet weekly on Sundays from 5:15 pm – 6:00 pm in Godspace Room A202. For more information on Royal Ambassadors, visit their web page www.royalambassadors.com or contact the church office at 843-249-2448.